Need great design work for your business? Designhill makes it possible to quickly find the perfect designs at the perfect price. It can be incredibly time-consuming, expensive & difficult to find high-quality design work. 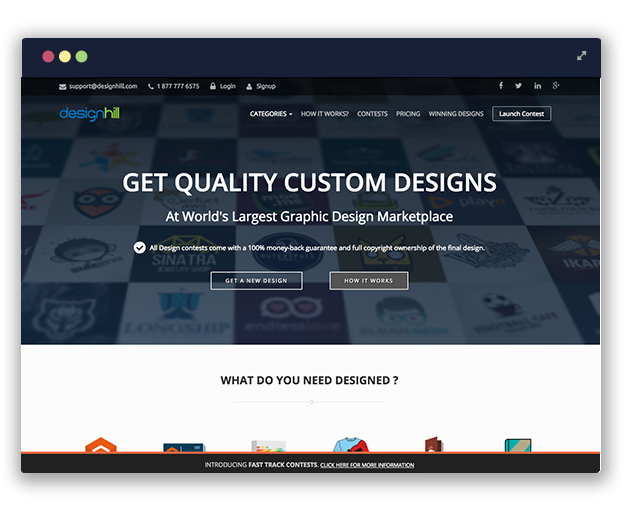 That’s why we created Designhill: an online graphic design marketplace built for the modern business owner. From Brand Identity, to logo design, to Webpage design, to T-shirt design, our global community of talented graphic designers can create the perfect design for you and your business. Fill out your design brief and post a project. Receive dozens of designs made exclusively for your business. Pick your favorite design, get complete ownership and download high quality files. One-to-One is an online space where you can choose and directly collaborate with individual designers, view designs, provide your feedback, receive invoices and pay for your design projects all from one convenient location. We just launched a readymade logo store on Designhill.com with a 24-hour turnaround. We’re so confident that you’ll be able to find a design you love with our community of 36,000+ designers that we offer a 100% money-back guarantee. We’ve proudly served over 5,000 clients—many of whom have returned for more high-quality design work—and only a handful have asked for refunds. THE PERFECT DESIGNER FOR THE JOB IS WAITING FOR YOU. Sign up for a free design consultation. THANKS FOR SIGNING UP FOR DESIGNHILL! Know any entrepreneurs or designers who you think should hear about us? Share this page with them!